Well, I have officially put both of my Etsy shops in vacation mode indefinitely. Essentially, I closed up my shops for now. Does this mean that I will never re-open my shops and sell on Etsy again? No. It is simply what is best for me right now so I had to make the tough decision to close both my Etsy fiber shop and my Etsy stamp shop. It has been an excellent run on Etsy though with almost 800 combined sales and over 700 combined positive feedback. I am very happy with my time selling there. You might wonder why I'm leaving when things seem to be going so well there for me. It probably doesn't make sense to some, but it makes perfect sense to me and really that is all that matters. For those who are wondering though... The main reason for closing up shop right now is to have more free time to focus on my family and other life endeavors. One of several secondary reasons is that Etsy is not the same place as when I began to sell there back in the Fall of 2006. Although I still consider it one of the best online selling venues for handmade, the atmosphere has changed there quite a lot, and I personally just do not enjoy selling there lately like I have in previous years. Also, I don't have the time to spend on constantly promoting my shop and listing/renewing items as seems necessary to sell well there. Etsy has many, many wonderful features though. It is just that I feel like I've entered a new era in my life and need a change. I also feel like Etsy has entered a new era, and I really no longer fit in as well there as I had in the past. I still love Etsy for many reasons and may decide to re-open shop at a much later date when the circumstances are different, but for now, it is "goodbye Etsy" and "hello" to other things. All the best with your new ventures : ) I agree that etsy and some other online selling places are not what they once were and I think people spend far too much time promoting for a few sales when they could be devoting that time to better things. The forums are scary places too. Good luck on all your future endeavours! 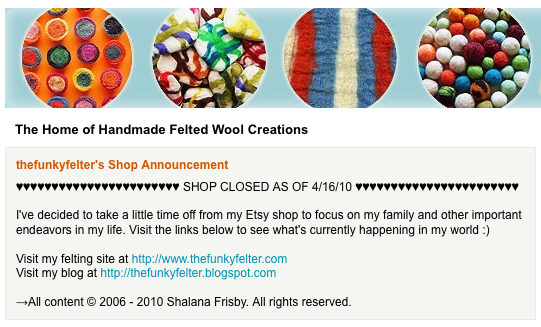 I'll miss your felting supplies on etsy lol, but maybe i'll open up an artfire buyers account so I can get more wool when I start to run out!! Thanks so much for introducing me to felting, and your amazing blog that provides support when I dont know what i'm doing lol. I'll miss seeing you around etsy, but totally understand. Etsy is not the same place it once was. Yes, way too much work for not enough return. I already spend too much time on the computer! All the best in your new direction and your family. I totally support what you're doing! Your little sweetie is only going to be this age once and it's one of the most important times. I agree that Etsy is not the best venue for your lovely creations and your new endeavors. Love your blogposts in my e-mail!